Painter Sarah C. Rutherford has changed the face of Jeffersonville — with two gigantic, regal faces that will surely become the town's defining works of art. Rutherford, 32, created a two-part mural, "The Silo Project," on the "canvas" of two old concrete silos beside the roundabout formed by routes 15 and 108. The north silo bears the face of an aging farmer, which Rutherford says honors Vermont's past. The south silo depicts the face of an 8-year-old child, which represents the state's present and future. 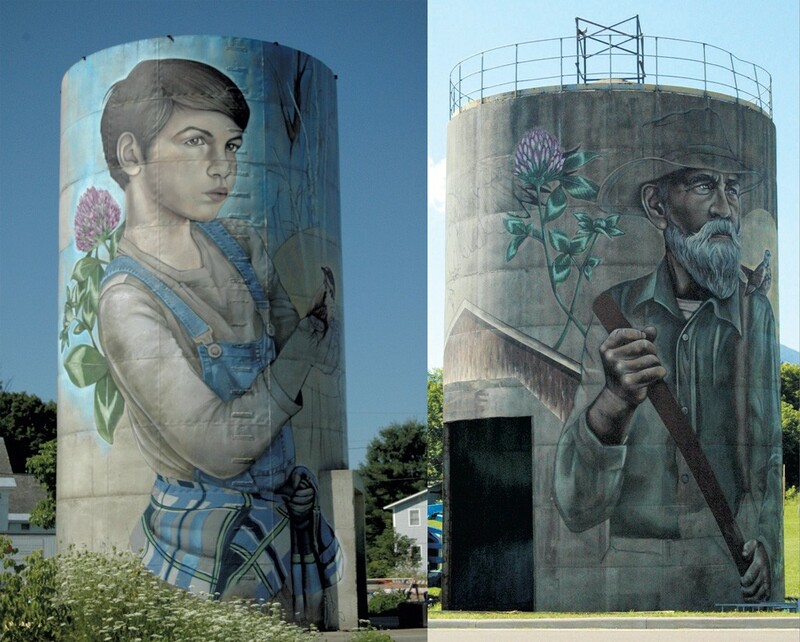 Each silo is 36 feet tall; at 5,000 square feet total, the two comprise the largest outdoor mural in Vermont, Rutherford says. The silos once belonged to the Bell-Gates Lumber Corporation. The south one was originally used as a kiln to dry lumber, while the north silo stored sawdust. The Village of Jeffersonville recently purchased the silos and surrounding land, which is adjacent to the site of its farmers market. The murals were funded by a $15,000 grant from the Vermont Arts Council and the National Endowment for the Arts. Rutherford, along with two interns and LN Bethea, who serves on the board of directors of the Cambridge Arts Council, began prepping the silos in mid-June. They worked six days a week to complete them by August 12 — the eve of the town's annual Festival of the Arts. The artist planned out her murals on grid paper, which she transposed by hand onto the concrete and then completed with spray and latex paints. The graceful confidence Rutherford displays in executing such large-scale work is impressive. She augmented the farmer portrait with draft horses, a church and a covered bridge, all of which had local models. Rutherford used CAC board member John Shaw's hands as the model for the farmer's; she even replicated the fresh cut from Shaw's saw blade in the mural. Images of hermit thrushes and red clover, the latter of which grows abundantly around the silos, appear on both to suggest the continuity of past and future. The child on the south silo appears in the company of a massive barred owl and a gazebo based on a historical model in Jeffersonville. This silo used to bear a street artist's image of a zebra; Rutherford thought about trying to incorporate it, she says, but it didn't fit her vision of Vermont in the future. So she covered the zebra but let other small tags and graffiti on the silo remain. "I like that there are vestiges of the graffiti still existing; that's part of its history," Rutherford says. While the mural's 8-year-old figure is based on a girl Rutherford knows, she says, she has rendered the child's gender ambiguous. The artist says she's heard both boys and girls look at it and say, "Hey, that looks like me!" Locals had a mixed reaction to the silo murals in their proposal stage but still voted to approve the project last August. Since Rutherford and Bethea began painting, they say, the response has been overwhelmingly positive. "You know that a community welcomes you when they bring you food," Rutherford says, noting that people have brought the artists coffee, lemonade, lunch and blueberries. Bethea adds that farmers have come and thanked them, and even offered advice: "The other night, one pulled up, and he was like, 'You need a belly strap for that horse.'" Rutherford told him with a laugh that she wasn't done yet; the belly strap was coming. Both artists say they hope the murals will draw visitors to Jeffersonville. "I feel like it was a community that was passed by, and this will change that," Bethea says. "The silos will become sentinels for the community."